Number Six learns of an impending assassination, "Plan Division Q," in which the target is the Retiring Number Two (Andre Van Gyseghem). Actually, these plans were deliberately divulged by the New Number Two (Derren Nesbitt), who hopes thereby to discredit Number Six. With no one willing to believe that an assassination is about to take place, Number Six finds that his fate may rest in the hands of a watchmaker (Martin Miller) and his daughter (Annette Andre). 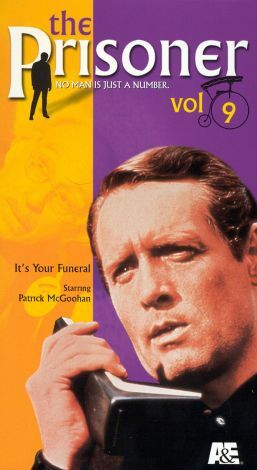 Written by Michael Cramoy, "It's Your Funeral" was supposed to have been the 10th episode of The Prisoner, but instead was telecast in England as episode number 11 on December 17, 1967. Its original chronology was restored when it debuted in America on August 10, 1968.